Waterbom Bali is where you can enjoy a full wet day out with family and friends. Through numerous waterslides, rides and playful games. This island’s premier water park is just across the road from the Discovery Kartika Plaza. 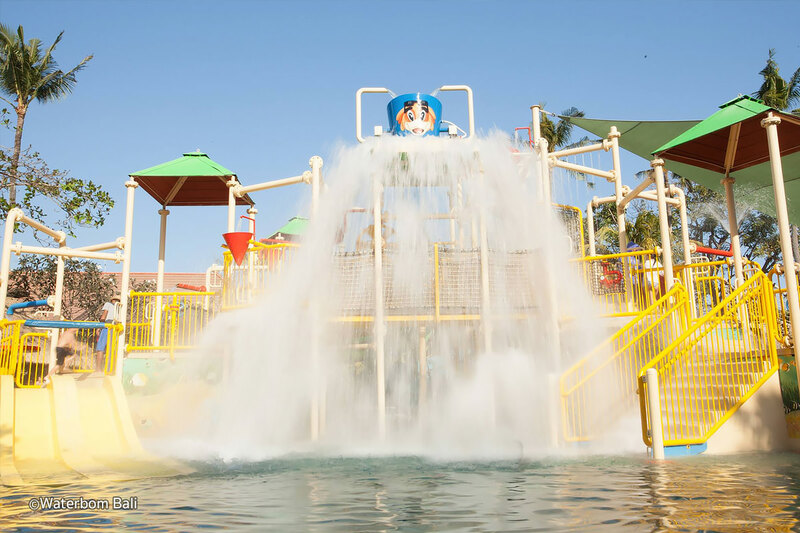 Has grown to feature 17 exciting slides and water games for all ages since its inception in 1993. The park covers 3.8Ha of tropical gardens and pools, as well as a complete host of dining and leisure facilities. 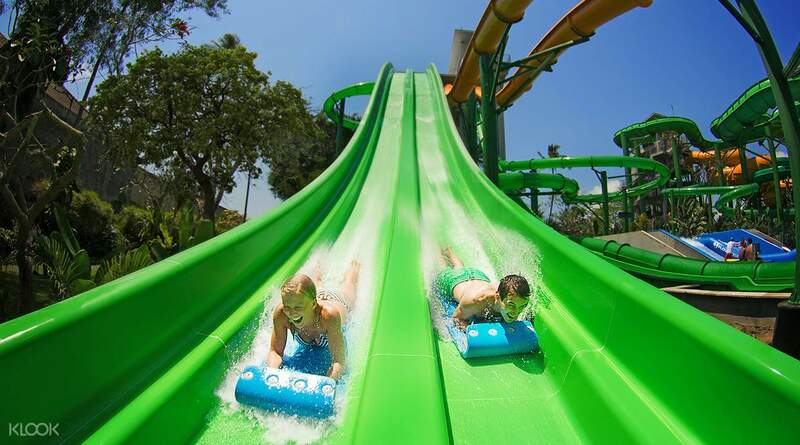 Waterbom Bali comprises numerous choices of slides that will keep you and your family occupied for a whole day. These include easy-going pools with mini slides to large scale adrenaline-pumping rides that start from significant heights. Services and facilities are top of its class, making it a must-do highlight for families while in Bali. The ‘Smashdown 2.0’ is an upgrade of a popular slide, hence its name. You start at a height of 25.9m, enter a capsule with a trapdoor at your feet, which then releases you down a an adrenaline-pumping chute of a ride. If you dare, opt for the more thrilling ‘Climax’ that ups the ante, dropping you down with 2.5 G force of speed, and whirls you through a near-vertical dip before looping back around. Other rides for thrill-seekers include ‘Fast n’ Fierce’ and ‘Twin Racers’ where you can challenge your partner for a splashing race down. The unique ‘Boomerang’ takes you and a partner to scream your lungs out as you twist down a 20m drop, then get swept straight up back up again, before a sensational free fall. Some of the rides require specially designed tubes with grips to hold onto. Other snaky rides that will soon be ready are aptly named, the ‘Constrictor’ and ‘Green Vipers’. 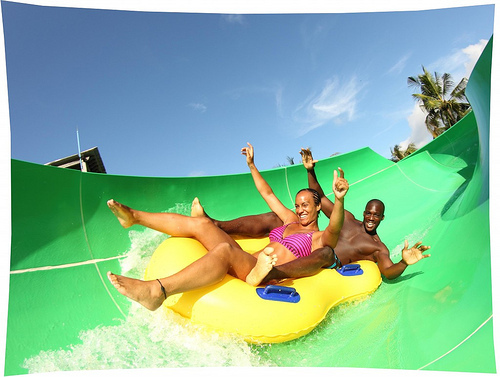 The latest addition at Waterbom Bali is the Flow Rider Double, which lets you live the dream of boardriding on a five-foot stationary wave supplied by FlowRider Inc. You can surf with a partner at the same time, with a choice of a stand-up or a lay-down board. 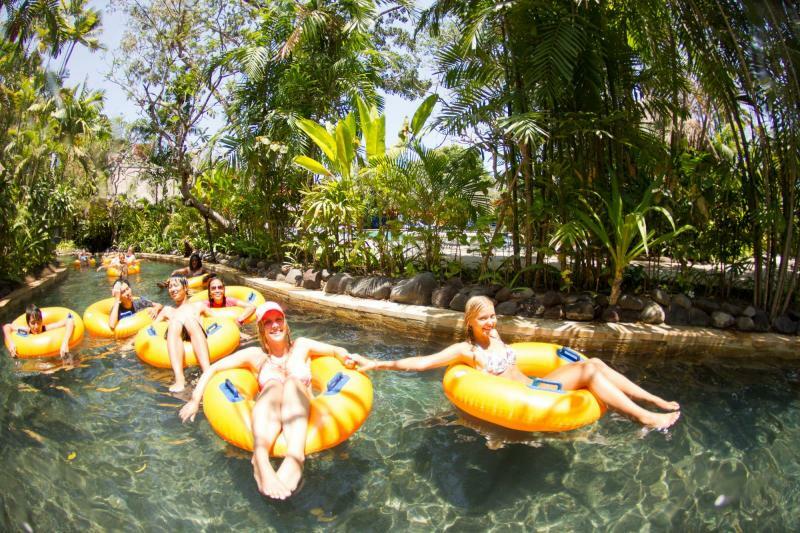 For a truly placid ride around lush gardens, take a tube for yourself or a double tube for couples and follow the steady stream of the ‘Lazy River’. 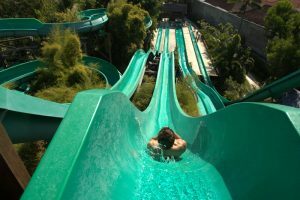 This is Waterbom Bali’s ultimate feature for a slow-paced relaxation ride through cascading waterfalls and lush foliage, and where you can forget the sense of time.